RC Radio: Towers of Light & Dark. Everything below the Spirit plane contains some kind of duality (light and dark, good and evil, right and wrong, male and female, etc). It is this dualistic nature of things that often propels situations into form, which then plays out in some sort of drama in your life. It is important that the duality within you be balanced, so that you do not get pulled toward one or the other side where duality is a strong component. For example, in some heated argument, there is often two sides to the story. If you want to see the situation for what it really is and not get caught up in the “sides” of the drama, it is important to maintain a null point in your perspective. The energy in this place will help you to maintain your perfect poise in dualistic situations. It will help you to bring balance into your reality creations and balance into your own outlook on life. It is an important energy to the spiritual seeker because without perfect balance you cannot progress to the higher levels of reality, where energy is much more vibrant, active, and volatile. 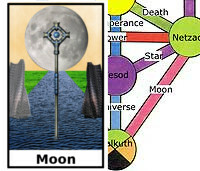 The Towers of Light & Dark are located between the Sephira Malkuth and Netzach, at the "Moon" Tarot Card location. Technically the Towers of Light & Dark are part of Malkuth, even though they are located on the crossway. As such, this place is one of the easier places to reach using your favorite nonphysical travel method. This place is also a good place to visit if you want to discover the spiritual undercurrents that are fueling some reality creation in your life. 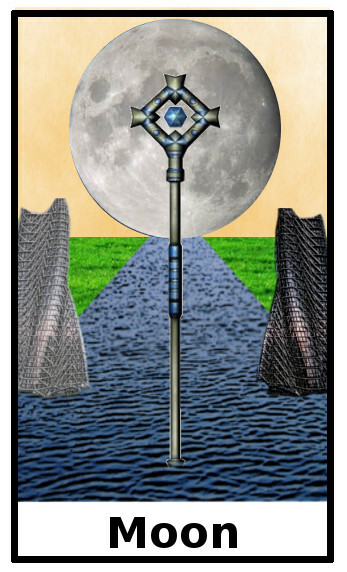 The Moon energy here is quite strong and this energy hides things from the conscious mind that is not yet ready to receive this knowledge. Visiting here can prepare your conscious mind for the realizations that will happen when the reality creations or changes you have been working with on an inner level break into the light of day. 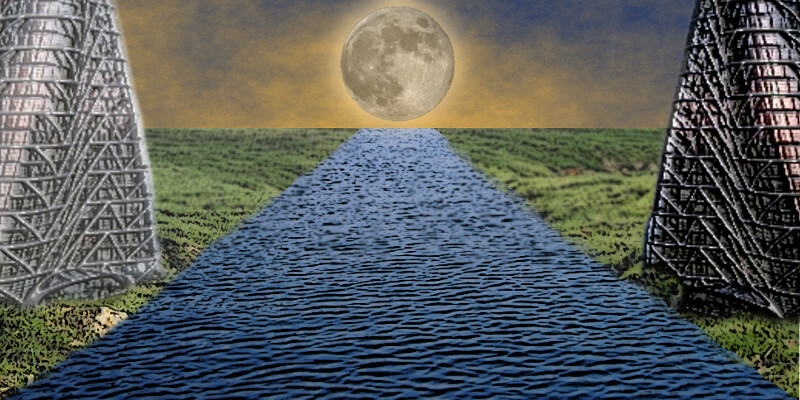 Your reality creations are prepared by the energies of the Moon before they manifest physically. You can often glimpse these coming changes in the form of dreams or even in your meditation in the form of images and feelings. These kinds of shifts in your life are often powerful and sometimes unexpected to the conscious mind, that has not been paying attention. The energy in this place will help you prepare for when these creations are ready to bear fruit and surface physically. The primary gift here can help you to maintain poise and perfect balance at such times in your life. This balance is needed to help a shaky new reality that has come forth from your desires, needs, and goals. Your main contact here will be Sandalphon, who will give you the quest you need to complete. This quest usually involves traveling to or taking some item to the towers and interacting with the Tower Guard at the top of each tower. Then returning to Sandalphon. The primary gift here, which you get upon completion of the main quest, will bestow upon you balance of the forces of duality within you. If you are a person of extremes this will certainly change your makeup significantly. The quests given here vary but all have one thing in common, you must visit the top of each tower and meet with the being there. Each tower contains one half of the energy upgrade you are getting. By going to both towers, you complete the main quest and get the energy upgrade contained in this place. In addition to the primary quest gift, when you are done visiting each tower, you will be given one of several secondary gifts, these other gifts are most commonly a book and a sword or some variation of that. If you get the sword, this nonphysical tool will help you break up dark energy and astral entities that are attached to you. It can help you to conquer your fears. Use the sword when you are in your dreams, travel meditation, or out of body event to slice up the dark energy or fear that blocks your path or holds you back. If you get the book, you can call on the power of the "WORD" to dispel the dark energies and use pure spiritual force to transform dark energy (when you get advanced enough). To get both the sword and the book and some of the other secondary gifts, you will have to visit the Towers again and complete another task going from one tower to the other. Memory Crystal: Help you to remember details about a past event. Gear: Gives you the ability to see the inner workings of things and even repair them.